Oswald in the Doorway (not) : the blog of the Oswald Innocence Campaign,debunked by Lance Uppercut: He's there...inside Ralph's mind! ( A new identification of the Oswald Innocence Campaign's "Guy not really using a walkie-talkie" in Altgens 6 ) - LEAKED O.I.C. INTERNAL MEMO! UPDATED! He's there...inside Ralph's mind! ( A new identification of the Oswald Innocence Campaign's "Guy not really using a walkie-talkie" in Altgens 6 ) - LEAKED O.I.C. INTERNAL MEMO! UPDATED! This was sent to me by an unknown insider at the O.I.C who identified themself only as "G", along with a scrawled note saying " What in God's name was I thinking?". we've been taking a lot of heat after Richard Hooke's latest gaffe about the walkie-talkie but I've given it some thought and come up with something that puts us right back in the game - this time I've really knocked it out of the park! let's see those lying, blood-soaked ops try to discredit this! I'm going public very soon but I wanted you to see an advance copy. I know you're going to love it! regarding Richard, maybe you can try to bring him back on message? because we're not really talking any more. anyway, here's the article. Enjoy! Richard, I've told you already that the amount of mistakes we can afford is precisely zero. And, at 1,483, we're currently way over that. You need to be more of a team player, Richard. Pass the ball around a little before going up for the shot. That said, I've taken it entirely upon myself to revisit the figure in question, and using the same techniques as I applied to my flawless analysis of the doorway area I went back to the photo again. And I was thinking to myself "Well, it's not a walkie-talkie, so maybe...just maybe.... Then, after literally a couple of minutes ceaseless squinting, I saw it. And, there can be no denying that I am absolutely correct, and this shall be the official position of the O.I.C on the matter from now on. First you look for glaring disconnects, something that jumps out at you as a dealbreaker. But you don't let those bother you, no siree. Look at the mask, for God's sake! It can't NOT be him! Of course, in Dealy Plaza we don't see the Phantom wearing his hair in his customary slicked-back fashion but this is simply because they transplanted Danny Arce's hairline ( or "cap" if you will ) into the image in order to "Arcify" it. 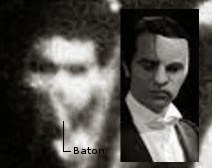 Notice also that he has dispensed with his formal dress shirt, which would have made him far too easily recognisable as the scourge of the opera house in nineteenth century Paris, his C.I.A deep cover identity. Nonetheless it's DEFINITELY him, and there is not the slightest doubt about it. And the eccentric, tortured musical genius proved to be the perfect choice to orchestrate ( ha! ) the assassination once it became apparent that George H.W. Bush's refusal to take his hands out of his pockets made it almost impossible for people to understand what he wanted them to do. Crucially we can see the Phantom wield his conductors baton as he directs the various teams of shooters in Dealy Plaza, and it's absolutely certain that's what he's doing. O.I.C senior member Tyler Newcomb probably agrees, and although nobody knows who he is and I didn't actually ask him we have a photo of him holding some sort of trumpet on the O.I.C website, so he definitely knows what he's talking about. If only Altgens had taken his photo a few seconds later, when we would have seen the Phantom's final dramatic three-foot leap into the air, furiously waving his baton in the direction of the grassy knoll as he cues the "Badgeman" shot. And there can be no question that's what happened, and only the bloodied would attempt to deny it. We know for certain that Senator Ralph Yarborough, riding in the Vice-Presidential car, would have filmed the whole event with his eyes, as I have shown with his sighting of Gordon Arnold. But, that film was lost to us with Yarborough's death in 1996. In fact it is the whole question of the missing "eye-film" footage which has led O.I.C senior member Richard Charnin and myself to regard Yarborough's untimely death at the early age of 92 as highly suspicious. We are truly living in a bizarro world when the entire population of the UK would seek to deny this. But, the pictures don't lie, even the ones I believe to be extensively altered. We can see the crazed fictional musician there just as sure as it's Christ on the cross, although obviously as an atheist I don't believe it was. Christ, that is, not the Phantom. He is most certainly there, and we can see him with our own eyes, and that trumps everything that anyone who was actually there at the time might have seen, or said. The conspirators could never have foresaw that the Phantom would be rocketed to fame and worldwide recognition by Andrew Lloyd Webber in 1986. Bad luck for them. And a very brief one because I'm away from home at the moment. Plenty to go at when I get back next week, since Ralph's ramblings seem to have taken an even more bizarre turn than normal at the moment. Well……. I don't see any deal-breakers here, do you? Hey, I read that Bean and Pulse Weekly issue, too, Lance ! Small world, isn't he, I mean, it? Ralph's invited his pals to a 'pumping party'. Oh, dear me…. no pictures, please, Agent 69. This is brilliant Lance. Thanks for the many laughs!